We have been packaging natural gas compressor packages since 1981. We package full turn key projects that include fabricating skids, mounting components & assembly, tubing, electrical/instrumentation, alignments, test runs, and painting of completed units, all at one location. We have built small portable packages to packages as large as 180,000 lbs. 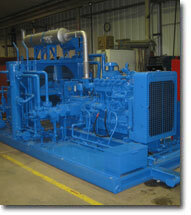 As well as manufacturing engine driven and electric motor driven natural gas compressor packages.